Known as “The Gathering Place,” Oahu is home to majority of the Hawaiian population. It’s the third largest island in the archipelago and a melting pot of cultures. East meets West in Oahu, combing ancient and traditional Native Hawaiian practices with different flavors from all over the globe. Honolulu, the country’s capital, is located in Oahu and is best known for its outstanding quality of life and thriving nightlife scene. 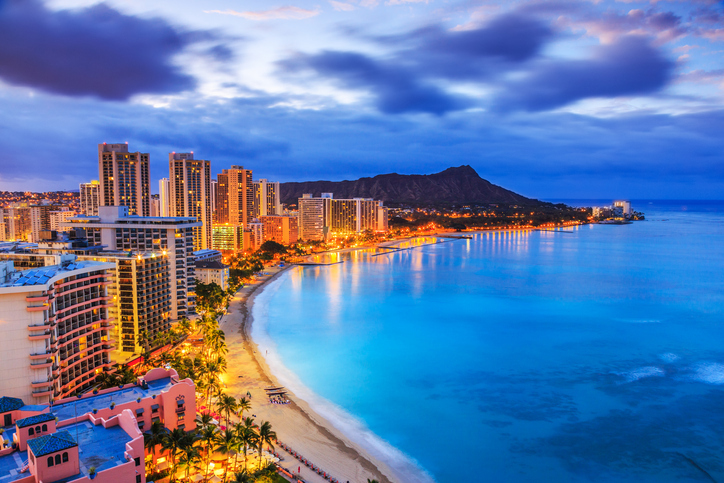 Other popular destinations located in Oahu include Waikiki, North Shore, Diamond Head, and Kailua Bay. 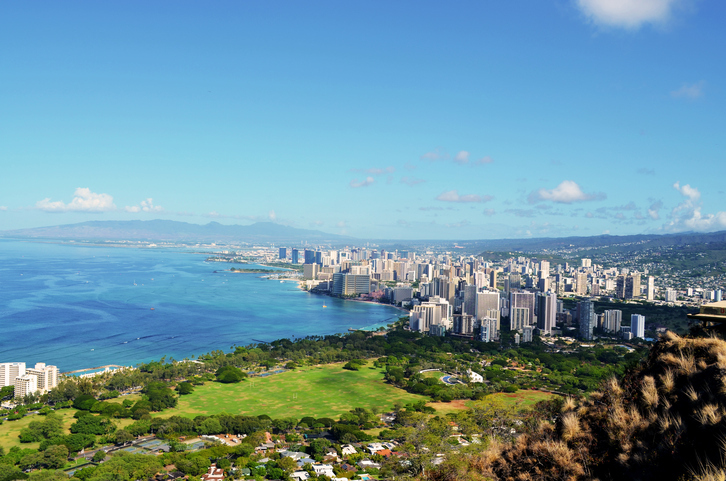 Located in Oahu, the tropical city of Honolulu is the capital of Hawaii. The volcanic island of Oahu is the cradle of the Kingdom of Oahu, which reigned for over 300 years in the island. Some of its most notable rulers include Mailikukahi, its first king, and Kalanikupule, who was the son of the king of Maui. The latter was eventually defeated by Kamehameha the Great, and upon conquest of Oahu in 1795, the Kingdom of Hawaii was established. Several other significant events transpired in Oahu, such as the attack on Pearl Harbor during the Second World War. Oahu is divided into several regions: Honolulu, Central Oahu, Leeward Coast, North Shore, and Windward Coast. Honolulu, the largest city and capital of the Hawaiian islands, is a tropical metropolis with a glittering sky- and shoreline. Pearl Harbor and the Dole pineapple plantation are located in Central Oahu. Leeward and Windward coasts, located on opposing sides, feature dramatic landscapes. Last but not the least is North Shore, regaled as the big wave surfing capital of the world. All this said, Oahu is definitely an island with plenty to offer. From world-class shopping, dining, and cultural gems to some of the best outdoor recreation in the world. It is, indeed, a gathering place that welcomes everyone. Oahu real estate ranges from towering waterfront condos and homes to single-family homes in lush communities. Oahu real estate is a market of diverse real estate options, presenting plenty of investment opportunities for different kinds of home buyers and real estate investors. The whole island offers, more or less, single-family homes, waterfront properties, condos, apartments, and townhouses that range from modest accommodations to luxury residences. To get a better picture of homes for sale in Oahu, a look at local markets would be best. For example, Honolulu’s districts offer a wide range of homes, but it’s most popular real estate include oceanfront condos and luxury properties. North Shore, a haven for surfers, has townhouses, beachfront homes, and bungalows among its offerings. Leeward Coast and Windward Coast are ideal locations for home buyers and investors looking for a more authentic Oahu experience, as these areas are relatively less developed than Honolulu and Central Oahu. The pristine waters of Lanikai Beach. Located in Lanikai on Oahu’s Windward Coast, Lanikai Beach is heralded as one of the best beaches in all of the Hawaii. 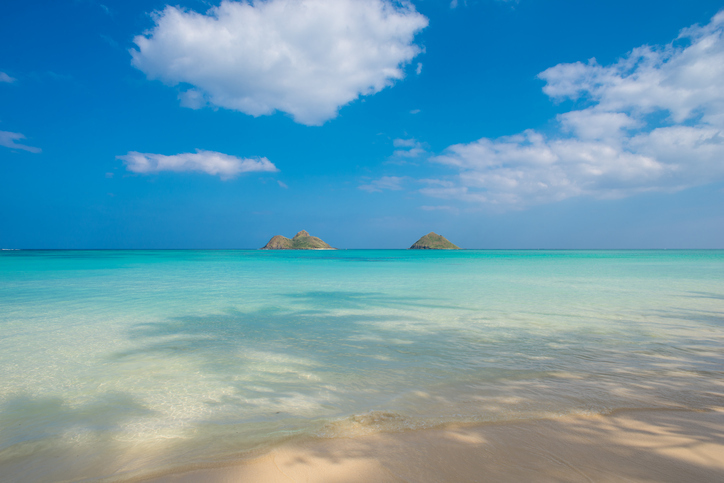 Lanikai means “heavenly sea,” and the sight of its cerulean waters will make one agree with its name. Lanikai Beach is a popular location for top-bill photo-shoots. The surrounding area is an upscale residential neighborhood. No trip to Oahu would be complete without going to the North Shore. The big wave surfing capital of the world, North Shore is great for surfers and non-surfers alike. The community is home to Mokuleia Beach Park and other attractions, as well as a plethora of dining options, including Pupukea Grill’s food truck. Oahu is borne out of volcanic activity, and some of its most beautiful geographic features include its small collection of massive tuff cones. This includes Diamond Head near Honolulu, Koko Head in southeast Oahu, and the Punchbowl Crater, also located in Honolulu. A Polynesian-themed living museum located in Laie, the Polynesian Cultural Center is home to six Polynesian villages where visitors can learn more about the shared history and culture of Hawaii and other Polynesian islands. The center offers circle island tours, evening shows, and exhibits showcasing different island cultures. If North Shore is for big wave surfing, Hanauma Bay is for world-class snorkeling. Located a short distance away from Waikiki, Hanauma Bay teems with marine life, home to over 400 different species of fish and other marine animals. The park is open all year round and offers a snorkeling package for a small fee. For a more in-depth look at Oahu real estate and Oahu homes for sale, such as Lanikai homes for sale get in touch with me at 808-214-0302 or Greg@IsleLuxury.com.